When all the biggies have an award show to their name, how could the people who deliver the best in cinema and television be left behind! Balaji had its very own award show that celebrated not just the best in cinema but also television talents of 2011. The name was all the show needed to bring the whos who of B-town to its red carpet. Here’s what the fashion on the night looked like. Bips was seen in a Rocky S dress that was premiered at the recently concluded LFW. She decided to ditch the funky tights Rocky had presented the outfit with and go all-legs for the evening. Unfortunately for Bips it’s a bit of a ‘did she forget her pants’ look that just doesn’t work. 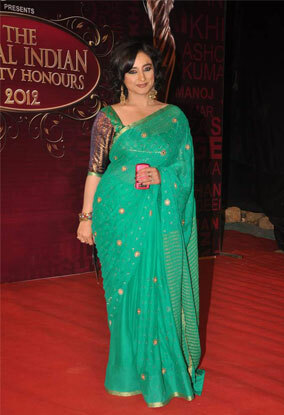 Divya Dutta stuck to her unique style and paired an aqua saree with a contrasting purple blouse. I quite like the combination however have issues with the dark eye makeup she opted for. And offcourse, the muchly overrated non-pleated pallu could have definitely been changed for a better outcome. 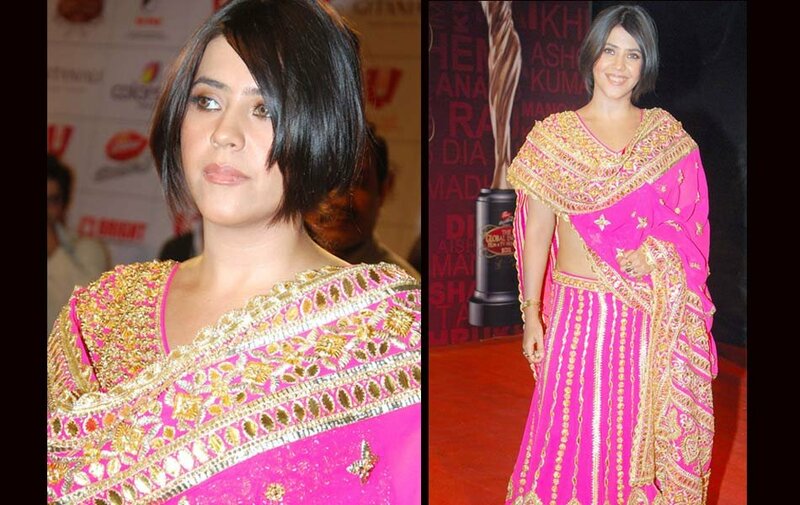 The hostess of the show, Ekta Kapoor, was spotted in a pink lehenga. Whilst we love that she’s trying new things, this one is more appropriate for a wedding than the red carpet. Lehenga aside, the new hair-do is right up her alley and she works it so well! Kudos to the powerhouse for daring to be different and here’s hoping she scores golden points from us one of these days. Jiah went for a very elegant silver net saree. She kept it simple with no jewellery and also avoided a fancy hairstyle. She works the saree quite well. Whilst there’s nothing too wrong about this outfit, it sure as hell doesn’t deserve the hot tag for being such a bore! A lace gown, really Kalki? Lets hope that she finds her style mantra soon! In her list of exciting and ‘out there’ new looks Kangana can add this DvF gold wrap gown that sparkled from a mile! If striking is what she was going for than she most certainly got it. It was another recently premiered runway outfit on the red-carpet, this time from Piggy Chop’s cousin Parineeti Chopra who ditched her normal knee length sheath dresses for a full length gown. Unfortunately like most of her previous red carpet looks, this one also falls flat on its face. PC opted for a champaign saree that was all too reminiscent of her Desi Girl look. The saree is quite perfect in itself however the look is a one we’ve seen PC do all too often. In addition the maang tikka seems a tad bit forced and the bumped hair look just doesn’t seem to be working for her. Verdict – Could be hotter. The Game debutant opted for a white Anita Dongre gown that she paired with aqua accessories. Love the hair, the dusky makeup and the overall minimalist look. Perfectly simple yet elegant and striking. Ms Dias knows how to work it! Another Anita Dongre piece was seen on the red carpet. Shazahn opted for one of Ms Dongre’s floor length salwar suits. Yet again a perfectly flawless outfit that suffers from a mild case of boring. Mrs Bendre-Behl does it yet again! A stunning look courtesy of a Shantanu and Nikhil outfit. The word flawless has never seemed more appropriate. The Jism 2 star made an appearance in a little red dress that she paired with black accessories. This one is quite a bit of a bore and I think trumps all the other boring outfits on the red carpet. With a body like that we truly hope to see Sunny glide down the red carpet in a striking ‘hatke’ gown that makes our jaws drop to the ground. For now we’ll just have to hand her the ‘not hot’ tag and wait for that moment. 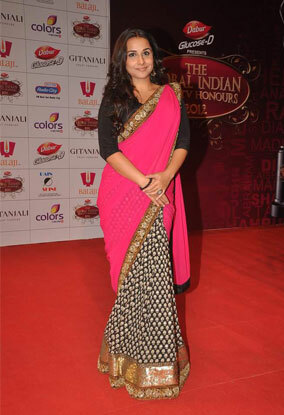 It was a half n half Sabyasachi saree for Vidya on the night. On any other day keeping in mind her recent track of Sabya outfits I’d have given this a ‘boring’ tag but the saree is just so much more exciting this time around. Thank God she opted for a young and vibrant color and diverted away from the mature colors she’s been opting for lately. Extra points for wearing the pallu up for a change, our prayers have been finally answered! One of these days Vidya Malvade will get her outfit right…this wasn’t that day. Keep trying Vidya! Zarine opted for a simple saree for the night, something she’s being doing a lot of lately. Her curves work the saree quite well but we wouldn’t mind her changing things up every now and then.